We just went down to Pass Christian, MS for a week, to help our daughter and son-in-law paint and landscape their home. These were all projects that wouldn’t be much fun alone, but with four sets of hands, it’s always more enjoyable, and seeing faster progress makes it even better. It wasn’t just work, though…we love the restaurants in this area, the balmy breezes coming off the endless white sand beaches and smooth waters of the Gulf, and the culture, which is so different from the Upper Midwest. And on this trip, some of my preconceptions were corrected about the biggest celebration down there–Mardi Gras! From only seeing news clips on the television, scenes in movies and photos in other media, I’d thought that all of Mardi Gras was wild–massive crowds filling the streets of New Orleans late into the night, drinking, bawdy behavior, and even danger. I had no idea about the wider scope of this annual celebration–or that much of it is actually family friendly. In fact, the timing is related to the church calendar, beginning after the Epiphany (Three Kings Day) and ending the day before Ash Wednesday, which then ushers in the Lenten season. Some of the parades are sponsored by local churches–such as the Catholic church in Pass Christian. These parades that can last up to three hours! 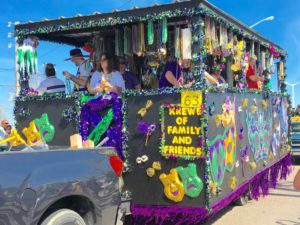 There are some festivities that are adult-themed, certainly, but many of the Mardi Gras parades in small towns along the Gulf Coast are meant for families, and there is even one with a pet parade. The photos here include several of the Waveland parade queen’s Maids–who were covered head to toe in gorgeous, shimmery, sequin covered dresses. My iPhone photos didn’t do them justice, and I missed getting a photo of the Queen–also an older lady who was beautifully gowned. Our daughter tells me that the Queen and her Maids are chosen from women who work hard to help make these events happen. A couple years ago, Emily brought a big bag of throw beads north, and are they ever popular with the grandkids–who play with these gleaming, glittering, colorful bead necklaces on the living room floor like they are a mountain of precious jewels. We attended the Waveland parade during our visit. 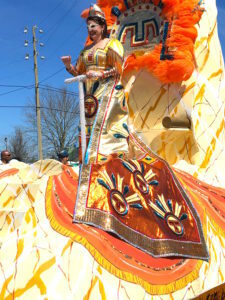 Thousands of adults and children of all ages lined the parade route, waving their arms to attract the attention of the people on the floats going by–who then threw bead necklaces into the crowd. Each float is sponsored by a “krewe”–or group of people who work on this event through the year. The beads and other throws make these parades a truly interactive experience. Many of the krewes also tossed plastic drinking cups, candy, and trinkets into the eager hands of the spectators–and various toys and stuffed animals to the children. Between the four of us, we ended up with well over twenty pounds of beads to bring home. I have always wanted to write a book set in New Orleans, or in the bayou country nearby. 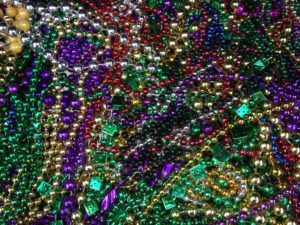 And now, I will know that scenes involving Mardi Gras can be suitable for a sweet romance…and they don’t need to be set only in New Orleans and the Gulf Coast. In fact, I was surprised to learn that big Mardi Gras celebrations take place all over–including California, Texas, Brazil and Australia. The second largest in this country is in St. Louis! So…what special festivities do you have in your part of the country? It would be fun to hear about them! Best wishes to everyone as springtime approaches! Hi, sounds like a fun holiday away, especially being with family! We have White Night and Moomba to name a couple of festivals in the city. Our little town also celebrates with a festival just before school goes out in December- it is so much fun, with the parade through town (with our obligatory robot! ), the CFA and SES and local clubs on their floats. The CFA also do a Santa run through town just before Christmas, they aim to get around the whole town in a day, giving out lollies to the kids. This is a HUGE deal- it is usually quite hot, and just after school has finished, so the fireys, (all volunteers) are giving up time with their families to spread the Christmas cheer. Jill, it was an interesting experience to finally have a taste of Mardi Gras! There is a day called “Old Farm Days” here, to share about and celebrate day of old and the way things were done then. We also enjoy a “Daffodil Festival” in a nearby town, celebrating all things Daffodils! What fun, Kelly! Both celebrations sound really interesting, and the Daffodil Festival sounds like it would be beautiful! You have definitely changed my perspective if Mardi Gras. We watch a lot of food shows and everything from that area always looks amazing. Because we live in rural Georgia, there are a lot of small town themed celebrations… One day festivals to celebrate the area. The town I grew up in has the dairy festival … Because the area as once rich in dairy farms and was considered the dairy capital of Georgia. Thanks for sharing your adventure. Joelle, I love small town festivals…such fun. It’s great to see families enjoying a good time together! Some of the Mardi Gras parades are still really wild and crazy, but I understand that the advance info on them is pretty clear about them being adult themed. And yes–the restaurants along the Gulf can be pretty amazing. And the fresh seafood is great. Our daughter can drive two minutes away and buy fresh, seasonal seafood on the docks in Pass Christian–huge shrimp, crabs, speckled trout are the ones that come to mind. A totally different experience from what we can buy in the Upper Midwest! Thanks for sharing Roxanne. I have never been to Mardi Gras. In Europe Mardi Gras is called Karneval and is celebrated in Southern Germany, Austria, and Switzerland – in catholic communities. In Bern, Switzerland the residents make elaborate wooden masks. In Germany Karneval is considered the fifth season and planning begins on November 11 at 11. Karneval is celebrate in many countries around the world. In Western Michigan, in Berrien County residents celebrate Blossom Time (apple blossoms) the first weekend in May, then their is Tulip Festival in Holland the second weekend in May, there is a Cherry Festival in Traverse City on Independence Day (July 4), and in Coloma we have the Peach Festival. Most communities in our region also have an Art Fair, 4th of July celebrations, Christmas celebrations, and a Winter Fest with ice sculpting. Renate, your comment is so fascinating! How I would love to see those celebrations in other countries! And your celebrations in Michigan sound like such fun. We spent a week near Traverse City a few years ago, and I thought the area was so beautiful. Thanks for the info on Mardi gras. I had a similar image to yours. A book would be fun. We have a large annual Easter festival church out reach , as well as trunk or treat at Halloween. I would imagine other areas have these as well . My area of rural British Columbia is one of the biggest fruit-growing areas in western Canada. We have Blossom Festival on Victoria Day weekend (third weekend of May), which includes a parade as well as many events like a demolition derby, concerts, a pancake breakfast, a street fair, etc. It’s a family-friendly event and well attended. And yes, fruit trees are often in bloom that weekend! My first full-length Arcadia Valley Romance, Sprouts of Love (releasing in May), includes some scenes from that community’s harvest festival. It was fun to create this festival with my fellow AVR authors! Interesting Valerie that your area also has a Blossom Festival with a parade. Every community in Berrien Country selects a queen and then Miss Blossom Time is selected. The Sunday before the parade area pastors bless the blossoms (mostly apple, but we also have cherry and peach trees). Plus a 5 k or more run! It’s rodeo week here in Tucson. We are fairly new to the area, and I have never attended any of the rodeo festivities, but they are on my list of things to do. There is a big parade associated with the rodeo. Kids are off school part of this week, too. Until this year, a town near us had a Begonia festival, with a floating parade down a creek! Each float was covered with begonia blossoms. Unfortunately, the local begonia grower has gone out of business, so they don’t have enough blossoms any more and have ended the festival. :-( Since the creek led into the ocean, they always had a sand castle contest on the beach as part of the festival too. Here in Portland Oregon we have the Rose Festival. It’s usually starts around the first of June, but there are many events before throughout the year that are connected to it. The first big thing are a couple of marathon runs downtown. Next there’s a Starlight parade (June 3) downtown. Finally our Grand Floral parade. (June 10th) (All the floats are made from organic things.) It’s a really fun and festive time. We end all this with fireworks along the waterfront. 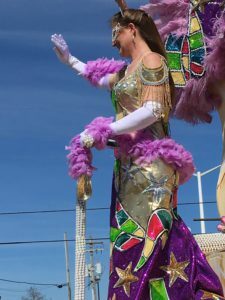 I enjoyed the blog post about Mamrdi Gras. How interesting. I had no idea that Mardi Gras was so family friendly in places. It sounds like you had a good time at the parade. I live near Cincinnati and on the Reds opening day there is a (very) long parade downtown and other festivities that take place near the stadium and around town. It’s quite a fun experience. Great post. I never had much of a desire to visit NOLA – but had an grant opportunity with Smithsonian to do a training there. We were staying in the French Quarter and my husband got to go with me. We were truly surprised how much we loved the city. We did got to Bourbon street for about 25 min and that was enough. LOL There is so much history and family things to do. I live in Alabama, and the original Mardi Gras was held in Mobile. I’ve never been though. My husband is from Gordo, Alabama (they have one red Light!). Each year there is a Mule Day/Chicken Fest that’s a pretty big deal. The Mayberry Tribute Artists usually show up. Food, carnival rides, craft booths, and a parade with carts and wagons pulled by mules. I’d hate to be on the clean-up detail if you get my drift! What a fun post, Roxanne! It sounds like a fun celebration, if you stick to the family friendly parts. LOL In Utah we have a celebration on July 24th to celebrate the arrival of pioneer settlers to Salt Lake City in 1847. There are parades and fireworks at various towns throughout the state, and a massive Days of ’47 Parade in Salt Lake City. Our small town has a fun parade and we can watch the fireworks from our back yard at night. Love the pictures of your festivities! We have the Newport Agricultural Fair. It’s the oldest agricultural fair in the state of Virginia. It is so much fun. They also put off a big fireworks show instead of doing it on July 4. There’s also a July 4th parade that consists of tractors, horses, boy and girl scouts, four wheelers, etc. It’s quite the small town! I like in a small town in Texas where Littke League Baseball is a really big deal. Opening day is filled with a huge parade down Main Street. Then at the park there are games to play for. Later in the day the resins get ready to play ball.